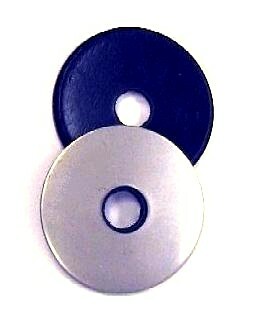 PRODUCT: 1/2" ID x 1-1/2" OD ( ID fits 1/2" fastener) 20 Gauge Hot-Dip Galvanized Steel with Bonded EPDM Rubber Washer. 1000/Box. Price/Box. MATERIALS: ASTM A-527 20 Gauge Hot Dip Galvanized Steel; Black EPDM Rubber, 70 durometer hardness per ASTM D2000; Overall washer height before compression about .130"; Available compression about 0.030"; EPDM thickness about 0.065". OPTIONS: Also available with backing materials of galvanized steel, high tensile aluminum, 304 stainless and 316 stainless steel, with facing (sealing) materials of neoprene or EPDM, and in boxes of 1000 - 2000. Please email for current pricing and available sizes.